Asthma is a lifelong, or chronic breathing problem caused by swelling (inflammation) of the airways in the lungs. It cannot be cured, but it can be prevented and controlled. When you have asthma, your airways are super sensitive, or "twitchy." They may react to many things. These things are called triggers. People who have asthma may wheeze or complain of feeling "tight" in the chest. They may also cough a lot when their asthma is not under control. Develop an Asthma Action Plan with your doctor. Go over it with your doctor or asthma specialist until you are comfortable with it. Update it often. Know when and how to use your medications. Take them as directed. Check your peak flow daily, if your doctor tells you to. Have your quick relief medications handy at all times. Watch for early warning signs of an asthma attack. Asthma is a serious disease, and can kill if it is not treated the right way. One large study showed that in the children who died of asthma, one third of them had mild disease! When it is treated the right way, people with asthma can live normal, active lives. Shortness of breath, chest "tightness"
Sometimes it starts in infancy, other times it starts later in childhood. Although some children seem to "outgrow" asthma, the disease never really goes away, there is just a time when you are not having any breathing problems. Asthma can also start at any time during adulthood, including the senior years. Some people start having asthma symptoms after a bad cold or flu. Other people develop asthma after a work-related exposure. If you suspect that you have asthma, see your doctor or health care provider. An asthma "attack" or episode is a time of increased asthma symptoms. The symptoms can be mild or severe. Anyone can have a severe attack, even a person with mild asthma. The attack can start suddenly or slowly. Sometimes a mild attack will seem to go away, but will come back a few hours later, and the second attack will be much worse than the first. Severe asthma symptoms need medical care right away. 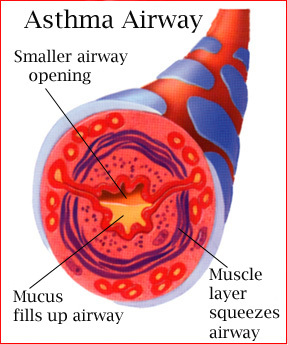 During an asthma attack, the lining of the airways in the lungs swells. 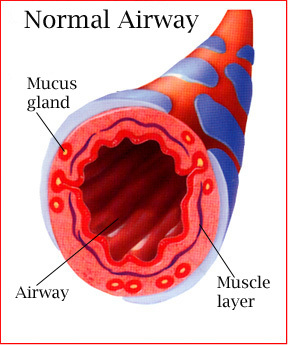 The muscles around the airways tighten and make the airways narrower. All of these changes in the lungs block the flow of air, making it hard to breathe. Knowing what is happening in the lungs during an asthma attack will help you to know why it often takes more than one medicine to treat the disease. The best time to plan for an asthma attack is long before one happens, at the doctor's office. There, the doctor, the person with asthma and their family can make an Asthma Action Plan that will tell them what to do if asthma symptoms start. Stay calm, and try to relax. It isn't easy! But the more you panic, the worse your breathing will get. Tell someone that you are having asthma symptoms. Get help if you need it. Don’t try to tough it out alone! Have the person stay with you. Take the quick-relief medication as your Asthma Action Plan tells you to. Not sure which medication is the quick-relief one? Ask your doctor, asthma educator, or pharmacist about it before you need it in an emergency! If the quick-relief medicine hasn't helped in 5-10 minutes, call the doctor or 911. Keep taking the quick-relief medicine, or as directed by doctor, every 5-10 minutes until the ambulance arrives. Never adjust your asthma medications or change how much you take unless your doctor has written it in your Asthma Action Plan or told you to do so over the phone. Miss school or work because of asthma? Have trouble being active or exercising because of asthma? Sometimes need to go to an urgent care facility or to the emergency room because of asthma? If asthma is not under control for a long period of time, there can be airway remodeling, permanent changes to the lungs.